Last year, while taking part in the Dieppe Fly Tying Forum, Julian met world-renowned fly tyer Davie McPhail who was visiting the forum from Scotland. Julian knew of McPhail from his instructional fly- tying videos which are posted on YouTube. While speaking with him, Julian mentioned how he loves to travel and announced that he was going to save up his money and visit McPhail in Scotland. Meanwhile, Julian has made quite an impression with ASF. 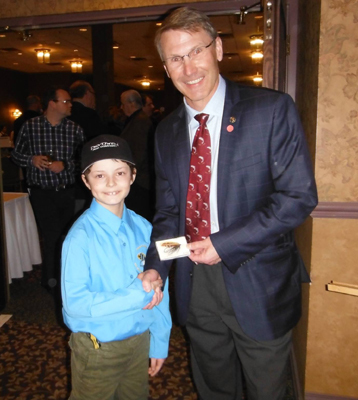 Earlier this spring, he attended an ASF fundraising dinner in Moncton where he generously donated one of his personally tied flies. The fly called Black Dog generated $250 for ASF at the auction. The Furlaga pair will leave New Brunswick on June 18 and will return the first week in July.